I grew up with stories of Polish heroines like Irena Sendler. I heard about them from my Polish mother who was barely a teenager in 1941, when she was rounded up in Warsaw and sent to a concentration camp for smuggling food. Her father had been killed, her mother was dying, and her brother and sister had already been taken. No one else in her family survived the war. But my mother never forgot the ordinary women in Warsaw – the teachers, the social workers, the nuns – the “angels of mercy” who detested war, but would go to the devil for a war-wounded child like her. I wanted to find them, to tell their stories, to remember them. 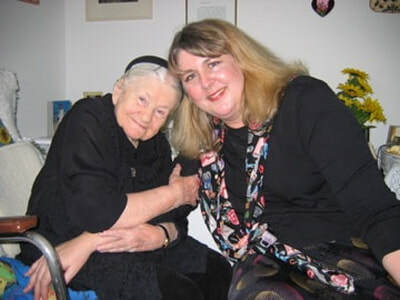 When I first met Irena Sendler in 2003, I knew I had to capture her on camera, in her own words, in the inimitable way she spoke, about the evil she witnessed and how she and her friends found the will to defy it. How did they make the choice to do it when it wasn’t popular and it wasn’t safe? And how – despite the obstacles and the risks – did they manage to do it for five brutal years? She much preferred to just visit and talk. In the nursing home where she lived, most of the residents suffered from dementia. They wandered the halls and often came into her room; one woman sometimes got into her bed and went to sleep; another occasionally tried to strangle her. But even at 95, Irena Sendler was sharper than ever and she continued to welcome visitors from around the world. She loved long conversations. And she worried about everyone. She worried about you, about the cameraman, about the nurse, about Hilary Clinton. She worried about war in the Middle East, about the men being sent to Iraq, about the children in Africa, about the violence and hatred she saw on the little TV in her room. She worried a lot about her beloved girls – the students in Kansas who had written a play and created worldwide media attention for her story. “What kind of world are they inheriting?” she implored of me. Irena Sendler hated being the only one left to speak for her wartime circle of friends. And she did not think that what they did was anything special. “If you see a person is drowning, you don’t ask questions, you just go in and get them out,” she insisted. It was a conspiracy – as in the Latin “to breathe in harmony”. What they did was as natural to them as breathing. But from her stories, those of others in the Polish Resistance, and the now-grown children they saved, I soon understood that it took much more. “Organizational genius” – Michal Glowinski, a child rescued by Sendler explained to me, and feminine guile, ruthless intention, and tireless commitment. It took the kind of courage you get when you have nothing left to lose. ​“There was no time ... we worked day and night," Sendler says. They could not overcome the inevitable German plan, but they could do their best to undermine it. To the end of her life, Irena Sendler continued to organize help for those she felt needed her. Calling around the world from her nursing home wheelchair, using her big-button phone with her reading glasses and a pencil, and her ancient, dog-eared Rolodex card file.